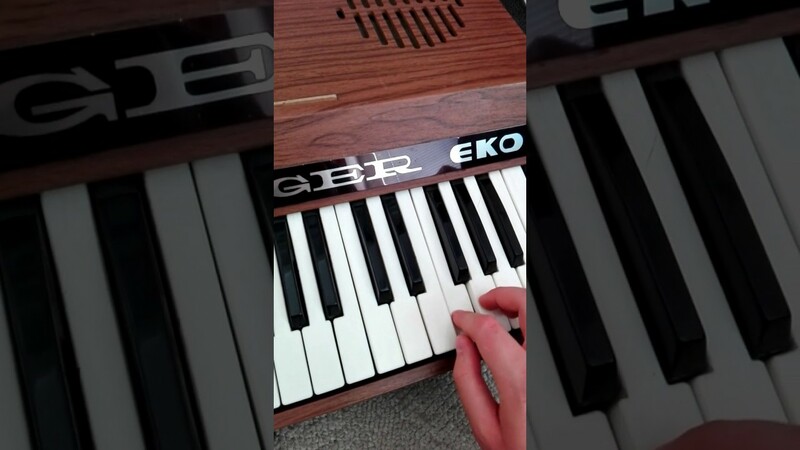 Two months ago, I posted a question asking about EKO Tiger combo organ, but received no replies, which is understandable taking into account that it is a pretty obscure instrument. I went ahead and bought it, though, because I thought around 200$ was a reasonable price for such a machine in good condition. It arrived a few days ago and it sounds pretty darn amazing, if not for a few issues. First of them being a certain kind of deadness, weakness, characterlessness, and thinness of the highest few notes. They seem to be much quieter, poorer in treble and bass, “crickety” in volume, and I think lack one of the lower "voices," but I’m not sure. I will post a video bellow this paragraph to illustrate this issue. I was thinking it might be an issue of “dry joints” or some other faults in soldering, but I’m not sure (I only know the very basics of electronics). Don't know if this little crappy video shows anything, but it's definitely worth leaving. The issue of volume “flickering” or “cricketing,” as I put it earlier, is also true of lower octaves, though much less intense and generally rarer. Here is another also-crappy vides of the organ playing in the lowerregisters, nice, clean and sweet-sounding - just how it should be. Notes: I put "VOX Jaguar-type organ" in the title, because saying I have got this issue on "EKO Tiger organ" would highly likely result in no replies and also because it essentially is VOX Jaguar-type organ." And also, I'm away for a few days now, so I won't be able to check anything or do anything to the instrument in the following days, but I thought it would not harm to ask these questions in advance, so when I come back I know exactly what steps to take. Cool organ, I think you have some contact issues. Select only one footage at a time and play each note, do this for every footage. You will probably find some keys missing tones for a particular footage. One thing you might find is that the highest footage notes repeat over the last octave. Then open up the case and find the contacts (switches the keys operate). some of them are probably not making contact. Adjust the contacts so every footage sounds on every key. You should watch some you tube videos on combo organ contact cleaning and adjustment there is a lot of helpful combo organ repair clips. Splendid! Thank you so much for help! I should be able to get this done within a week or two and will come back with the results. Thank you again. Ok, so I more or less adjusted and cleaned all of the contacts and gave the connections on the circuit of the "problematic note" a bit of a massage and it was a bit better. I don't know what came into my mind, but I decided to hold down that one note with volume of the organ at zero, thinking some voltage flowing through the circuit would do it some good. And guess what - it did! The problematic A is almost perfect, but the difference is barely hearable now. One note that hasn't caused amy problems earlier starts being brittle, like the aforementioned A before, but now I know what to do. There also seems to be some sort of a contact issue with one of the voice selectors, but, as I said, I know what to do now. The whole job would probably be very easy if I could actually have the organ turned on while adjusting contacts, but I am scared to even think of doing that (although there were a few videos on YouTube of people doing that). Anyway, thank you for your help, Ted! I'm not a tech, but If your organ is like a Jaguar or other full transistor organ, the voltage on the boards is only 9-12 volts and is about as safe as it gets as far as poking around with live electronics. The voltage on the keying may even be less. But the power supply will have line voltage before the transformer. As long as you are careful you will be OK. There are some stickied articles about safety when working on electronics you should view. Be careful with the fine contact wires, use tweezers and have good lighting. I was really careful working on the Hohner, the xenon bulb divider circuits use a 300 volt supply, but I don't think I would have been able to set all the contacts correctly if it wasn't on when adjusting them. There are probably three or four sets of contacts on each key, you will want to check the contacts by footage (4',8'16') these numbers represent different octaves, having one missing will make a note stand out as duller or brittle depending on which footage is missing, so check the keys with only one footage switched on at a time on, the missing footage stands out as a dead note that way. Sorry for a belated reply, it's good to know. And there is actually one contact for each key, the sounds you can get using those controls are only filters, from what I understand. The basic core tone, consisting of a few different footages is unchangable in itself. Also, one question. Are combo organs always very loud when conected to an external speaker or amplifier? Because my EKO has only one, stereo line-out, which is labeled "earphones." Therefore, when I use an amp and even headphones, I need to have the organ volume quite low to get a good, normal, undistorted clean sound. Is this normal? And, more importantly, is it safe to use that line-out with a normal mono 1/4" cable going into an amplifier? Or should I have it modified so it is a normal line-out? I'm taking it to a tech one of these days to fix one other issue, which I sadly can't do myself with my limited skills. Thanks in advance. EDIT: Ok, now I found out that if I want to use it with an amp, I will have to ask the tech to do a little modification in changing the impedence level of the "earphone" output to that a normal line-out. If you are going to a guitar amp, it's likely too hot - in that case all it needs is a switch that changes it from stereo to mono, with a a resistive pad to drop the level. Oh, I didn't think the mono/stereo thing would make such a big difference. I just plugged the organ to a mixer and it was still extremely loud and kind of saturated. Let me ask this way: suppose I have it made to a standard mono line-out with a resistive pad to drop the level (to work well with a guitar amp), can it still be used normally with a mixer, if I want to record to a 4-track for example? Because, from what I gather, the stereo output seems to only be troublesome and, I think, unneeded here. I'm sorry if I show dumbness, I just don't know much about electronics. Just made quite a discovery! When you plug the organ to an amp via the "PEDAL" output, it sounds more or less how it should sound, not too hot, just quite a bit more trebly than from the built-in speakers. The only drawback is that there is sound coming out of both the speakers and the amp that's connected to the "PEDAL" output. I'm going to try it with a mixer of my Tascam in a few moments and will come back with an answer as to how it should sound, but now I'm totally confused. I don't have an expression pedal that came with the organ and have no idea whether I should or should not modify the "EARPHONE" output of the instrument. Just in case, I don't think I can find a good reason to keep the "EARPHONE" hot. Still, don't know what I should do. Last edited by BeastoftheEast; 08-31-2017, 05:55 AM. You can use a DI box to pad down the signal from the headphone socket so that you don't have to modify it. It can also convert the signal to a balanced one at the same time which reduces the danger of hum on its way to the mixer. Your mixer should be able to receive balanced inputs. What is the secondary (output) of the transformer on an Eko Tiger 3000 (lot2 1976)? I've my father's organ which I would like to pass to my son. The PSU is dead and there are no markings indicating the output. The input is 220v AC backed up by a 1amp fuse. There are two grey and one yellow cables from the secondary side of transformer to what I'm guessing is a half wave rectifier. I would very much appreciate any infomation on a suitable replacement, output voltage and also why two grey cables?